Blue, aqua, chartreuse. Lava rock blacks and grey. The colors of Hawaii coasts. Add a bit of local turtle, Honu, and some waves, and here's my impressionist result in a mobile. 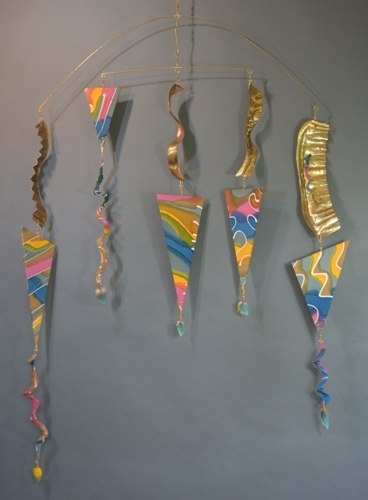 Hand-painted silk covering foam core with brass swivels and rods. A little feathers added for a soft touch. Imagine movement of soft warm flows over ribbed metals. 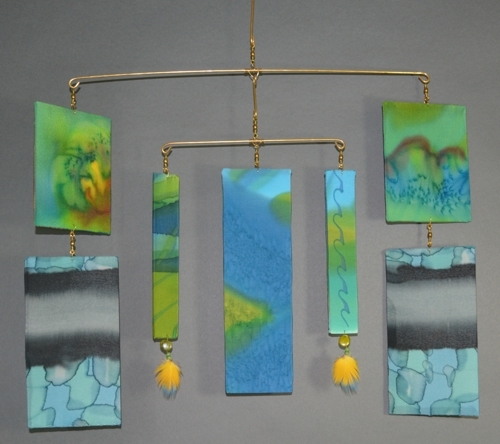 Hand-painted silks covering foam core joined with jewelers gold metal formed pieces, with wax coats for sealant. Combined with swivels and brass rods. And some blue and yellow feathers for the softest look ever on the ends. Ocean... Flow Vibes. I made this when I found a new song by Pretty Lights called Finally Moving, which I listened to over and over and over for a month while working on this mobile and a fashion collection of 15 for a show. Most of the song words are "I Get A Good Feeling". It was my theme song for the fashion show. Hand-painted silk covering foam core, with quilting and stitching added, brass swivels and rods, along with some puka shells. My sister used to collect them and make jewelry back in the '70s when she lived in Hawaii. Hand-painted silk covering foam core and wire with beads. Professionally steam set dyes for lasting color. Keep out of direct sunlight as for any fine art piece. Mobiles for indoor use only with slight breezes. Hot, fountaining, lava spouted and spit for 3 months recently 20 miles from home. A river of the liquid flowing to the sea. Lots of earth rattles and rolls. Makes me think of what's really important in my life. Family, passion for living, peace with myself and others. This mobile came from those thoughts and a couple of my reasons for being, as quoted on the mobile. And it was also made with intention of the theme, It's All Relative, for a New York juried fiber show where it was shown. Hand-painted silk covered foam core with brass swivels and rods. The island of Hawaii is home to 11 of the world’s 13 climate zones. There are as many different climate zones on the island of Hawaii as exist along the entire coast stretching from Alaska to Costa Rica. 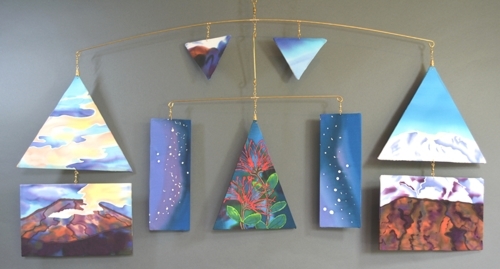 This mobile is for our tallest mountain, Mauna Kea. In Hawaiian mythology, Mauna Kea is home to the snow goddess Poli‘ahu. In ancient times, the summit was considered the realm of the gods and was kapu (forbidden) to all except the highest chiefs and priests. Now, astronomy has chosen to use it for obtaining universal knowledge, like no other place on our earth. Feeling the light of the world and wanting to spread it. Maybe a bit of ocean and sky, the warmth that can generate from there. And where the birds have life. Hand-painted silk covering foam core and wire with beads and swivels. Some feathers too from my friend's birds. Professionally steam set dyes for lasting color. Keep out of direct sunlight as for any fine art piece. Mobiles for indoor use only with slight breezes. It's all about the colors! Lighten Up! Be kind to yourself! Go with the flow! Show your courage! This is the first horizontal mobile in this series. They move so playfully, I just love that. So I keep making them! Hand-painted silk covering foam core, brass rods and swivels. For over 3 months about 20 miles from my home, lava was spouting from many ground fissures and ran a river to the ocean! Many people lost their homes and farms and livelihoods. The island no longer is the same in many ways, new coastline, favorite beach parks and places gone. There has been an algae bloom in the waters, the first sign of life. Scientists say that the chemistry of the lava interacts with the ocean to provide a nourishment, a fertilizer if you will, and that promoted the growth of plants. Wow! 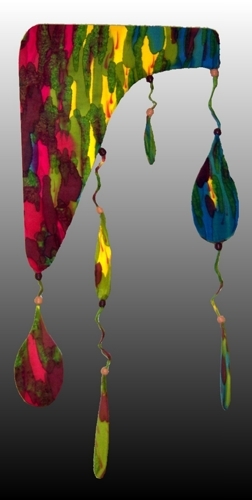 Mobile is made of hand-painted silk, using wax for the resist lines. Pieces are quilted and stitched. Very light as covering foam core. Brass rods and swivels used. 7 1/2 feet tall, made for a Montana home to bring the forest inside. Tall ceilings just call out for this 6 foot strand of color and movement. 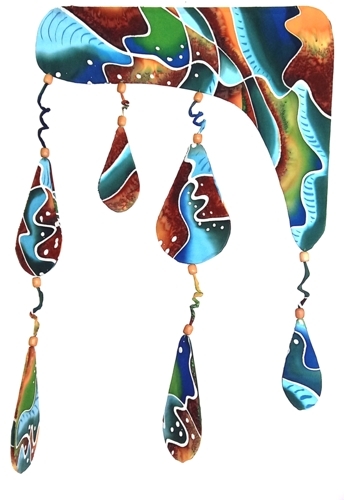 Hand-painted silk covering foam core with beads on swivels between each piece to have a nice flow. Dyes are professionally steam set for lasting color, but like any work of fine art, needs to be kept out of direct sunlight and indoors, save from too much wind. Floral representation with some colorful abstract. 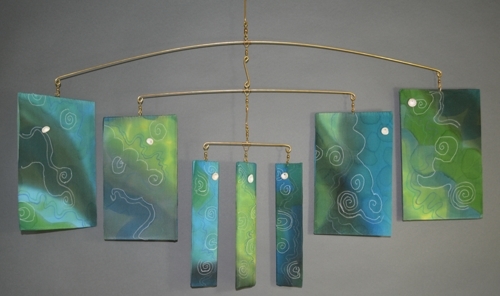 Movement abounds with this double strand style mobile. This was a commissioned piece. You can pick your own colors, and we'll talk about some representational design work you may want. 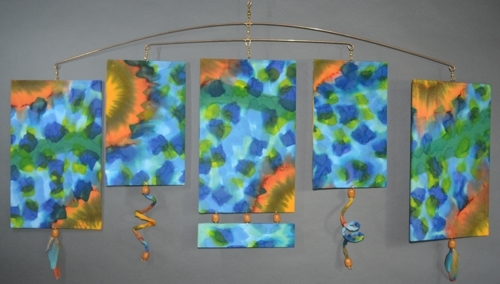 Hand-painted silks covering foam core with beads and swivels. Vibrancy for any space and 2-sided to give a look like no other. Bamboo on one side, fern and fiddleheads on the other. The supporting top and bottoms panels were once a scarf I like so much, I framed. It reminded me of the Ents in the Hobbit book. I'm just a happy tree hugger. Ents are a race of beings in J. R. R. Tolkien's fantasy world (with the Hobbits) of Middle-earth who closely resemble trees. They are similar to the talking trees in folklore around the world. Their name is derived from the Anglo-Saxon word for giant. The Ents appear in The Lord of the Rings as ancient shepherds of the forest and allies of the free peoples of Middle-earth during the War of the Ring. The Ent who figures most prominently in the book is Treebeard, who claims to be the oldest creature in Middle-earth. 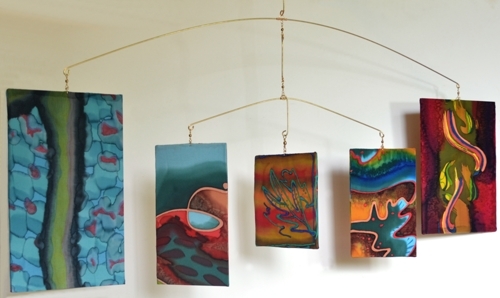 Hand-painted silk using wax for resist, covering foam core, with beads to join. Hand-painted silk covering foam core with beads. Professionally steam set dyes for lasting color. Keep out of direct sunlight as for any fine art piece. Mobiles for indoor use only with slight breezes. Hand-painted silk covering foam core and wire with beads and swivels. Professionally steam set dyes for lasting color. Keep out of direct sunlight as for any fine art piece. Mobiles for indoor use only with slight breezes. Seguaro cactus blossoms live on this mobile, appropriate for it being in Arizona. Hand-painted silk covering foam core and wire with beads. Professionally steam set dyes for lasting color. Keep out of direct sunlight as for any fine art piece.